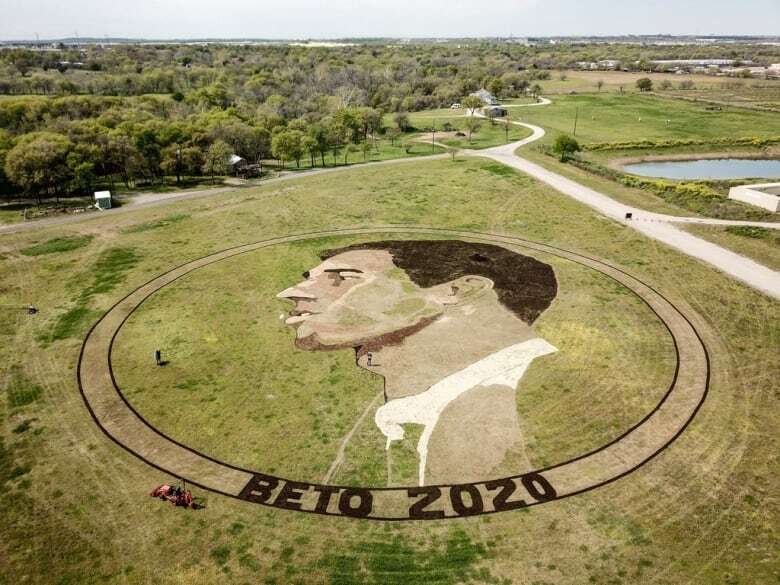 Kansas artist Stan Herd demonstrated his support for Democratic presidential candidate Beto O'Rourke in a way few others can: by enshrining his likeness in a giant crop circle in a Texas field. 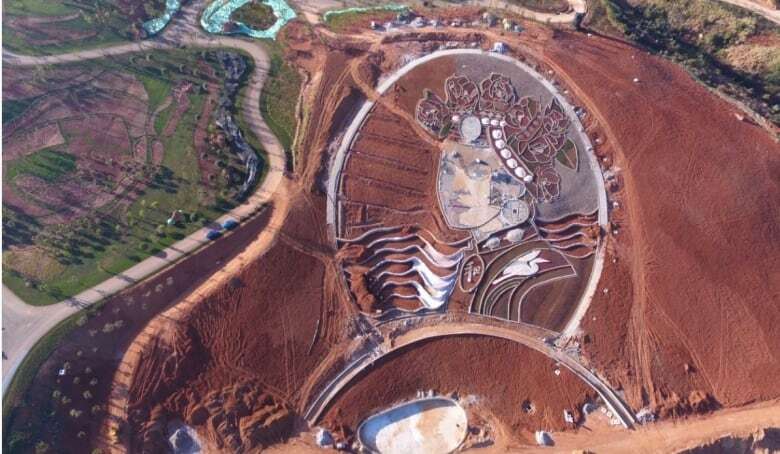 A two-acre circle with a profile image of the El Paso politician's face has been carved into a field near Austin-Bergstrom International Airport. 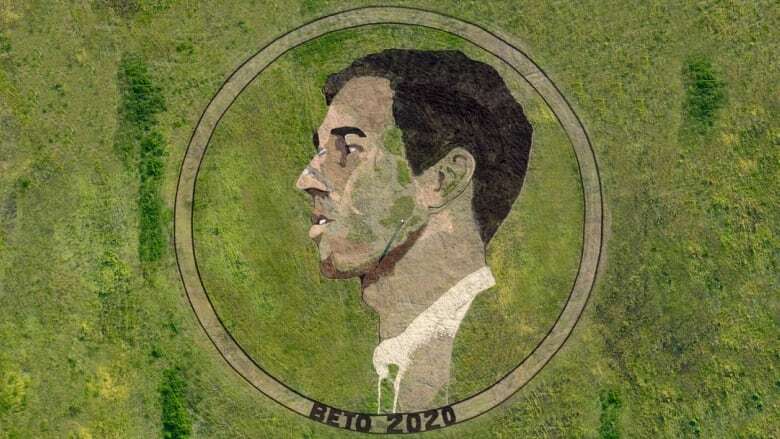 The coin-like art also includes the words "Beto 2020." Herd and his team have been "stunned" by the public response to the work. "I've been at this for 45 years creating earthworks and ... this has kind of been unprecedented," he told As It Happens host Carol Off. Herd says he etched the portrait out of grass, mulch and clay. All told it took two weeks to construct, at a cost of about $12,000 US. "It does look coin-like," said Herd. "We've been teasing about, you know, the bitcoin. Now we've got Beto-coin." In an interview with The Hill, Herd says he used pecans to form parts of O'Rourke's eyes. He chose the nuts because they're popular in Texas, and they imparted a "nice, brown colour." The artwork was unveiled Sunday at Carson Creek Ranch. Land was donated for the project. Herd told The Associated Press he expects the portrait to last about two weeks before deteriorating due to weather. 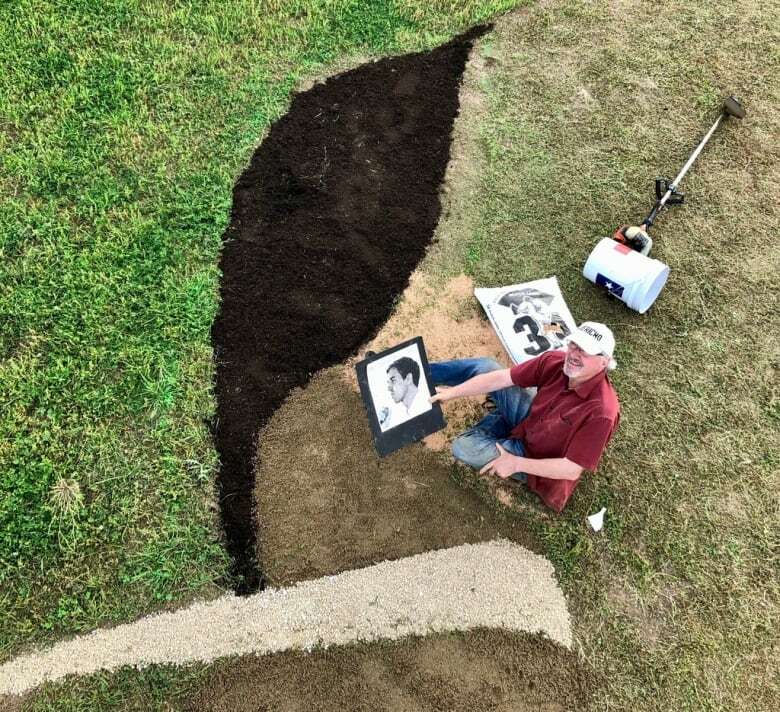 Herd said he and his team built the portrait near the airport so they can show their support for the politician, who rose to prominence while trying to unseat Republican Sen. Ted Cruz in 2018, to as many people as possible. Herd and his family are lifelong Democrats, but lived in the mostly conservative-leaning southwest Kansas. He likes what he's seen of O'Rourke so far, as a possible salve to what he described as the "vitriolic" tenor of politics in the U.S. under President Donald Trump. "I've met Mr. Trump; I've been in his office twice. I created an image on his property years ago," he said. "And I think he's the wrong leader for our country right now, quite frankly." Herd thinks O'Rourke has a wide appeal for political moderates that could bring together people on both the Democratic and Republican sides of the electorate. "I just feel like that Beto O'Rourke has a calming voice. He's got a populist appeal. He's level-headed. He's compassionate," Herd said. "He has all of the things that my parents and my teachers and my preachers and my brothers and my family said that you should look for in a leader and he evidences that." Not all of the reaction has been glowing, however. "I think somebody said, you know, 'I'm going to bring my dog out to the field so he can have some fun.' I won't say what they say," said Herd. He's taking it in stride, noting that any kind of political art or commentary will attract naysayers. "Haters will be haters ... but it shouldn't dissuade you from saying what you need to say. That's what democracy is about." Over his career, Herd has created earthworks of everything from the Statue of Liberty to Van Gogh's Olive Trees painting. Dan Rather once called him "the father of crop art." He's also been incrementally working on a series of profiles of Indigenous women around the world, from Brazil to China. He sees his work as having a unique ability to spark discussion and awareness about issues he feels strongly about. "I think art has a power. And art [that is] seen and talked about — and quite frankly interviewed, you know, from Canada about — has resonance," he said. "It becomes part of the language [and] part of the discourse of what's going on out there." Written by Jonathan Ore with files from The Associated Press. Interview with Stan Herd produced by Sarah Jackson and Ashley Mak.